Neem trees are heat loving plants and grow best in hot climates. They can tolerate cooler weather, down to about 35 F or 5°C. However, if your climate has long periods of such cool weather, or if it gets even colder than that, then you won't have much luck growing a neem tree plant in your garden. The obvious solution is to grow neem as a house plant, in a pot inside. So let's see how to grow a neem tree indoors. Neem grows easily from seed. If you can get hold of seeds, that is. Just put your neem seeds in a pot with a very good quality potting mix, cover them with an inch of the mix, and keep that pot moist and warm. Neem seeds should germinate within one to three weeks. The cooler the temperature, the longer the seed will take to germinate. 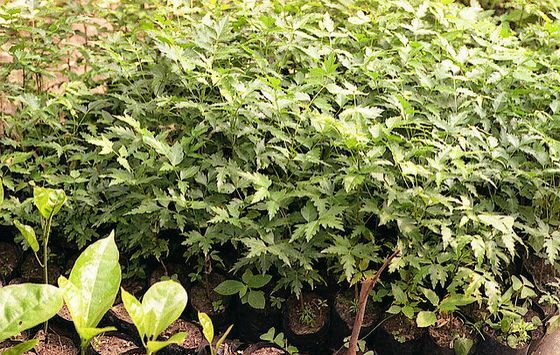 Why is a good quality mix so important when neem is such a hardy tree that will grow well even in the poorest soil? Because if you grow a neem tree outside it can develop a huge root system. Its tap root will reach far, far down to mine the deep layers of soil for nutrients, and lateral roots will spread wide and far to go foraging for more. A pot is not a natural environment for such a vigorous tree. It is very restricting, so you have to look after your neem house plant a lot better and give it more care. Make sure you use a good quality, free draining potting mix. Once the seed has germinated and the tree is growing fertilize it regularly with a complete and balanced fertilizer. Adjust the amount to the size of the tree and the time of the year. Use more when it is actively growing, cut back or stop fertilizing in winter. As a guideline, while the tree is actively growing, I would suggest weekly watering or spraying with dilute fish emulsion (use about half of what the package says), and a monthly application of a balanced solid organic fertilizer. Your neem house plant will initially grow only slowly, but once it is a year old it should take off, provided you look after it well enough. Looking after a neem house plant is not difficult. Water it regularly, but don't overwater. Make sure the soil feels dry before you water it again. Overwatering is probably the biggest risk for your neem tree. They really can't stand wet feet and can get problems with fungi and root rot. If you are watering enough but the leaves are wilting try misting them regularly. That's a good thing to do anyway and most house plants will appreciate this kind of attention, especially in times when you are heating your house. Heating makes air very dry, which is not good for plants. Wet feet is about the only problem these hardy trees can have. Because of their unique insect repelling qualities neem trees don't have any problems with sucking or otherwise damaging insects. People actually grow them in the hope to repel pests and protect other house plants. Personally I doubt that just growing a neem tree nearby would work if you already have a problem, but at least insects like scale and spider mites will leave your neem tree alone. And you can use your neem tree to make natural sprays against the insect pests. Why move it around? Because in summer your neem tree will be happiest outside, but in cooler weather it prefers a big, sunny window. In theory you could of course keep it inside all the time, but it will grow a lot less if you do, and not be as healthy and vigorous. They really do need all the sunlight they can get. A happy, vigorous neem tree can be pruned without hurting it. They respond very well to being cut back by putting out lots of new shoots. So if you want to harvest your own neem leaves for home remedies you can. Just remember that a tree that grows many new leaves needs a lot of feeding. The best time to cut a neem tree back is spring, and then give it another smaller trimming in late summer. supplementing artificial light for a few hours after dark, the brighter the better. It's unlikely that you will harvest many seeds. Neem plants just do not fruit well in pots. But hey, you never know your luck. May your neem tree grow well! Look for home remedies and homemade sprays using neem. Read about growing neem trees outdoors. Read about the neem tree's many uses and benefits.